I wore this outfit over the weekend! This is a comfy outfit. Jeans and a loose sweater. I love lightweight loose sweaters. They are not constricting and let you breathe. I paired this neon top with blue. I like mixing blue and green together. I love your cap toe shoes! It must be cool over there if you're able to wear sweaters still! Thank you! It was cool last week. Not that way at all today! Stepping outside for five minutes and I was sweating. The cool weather was fun while it lasted! Back to hot/humid STL. Thanks for reading! Gorgeous color combos! Love the neon with a little splash of leopard. What lipstick are you wearing? It looks amaze. Thank you! I love mixing leopard with neon! Such a fun combo! The lipstick I am wearing is Revlon Lip Butter in Lollipop! Currently one of my favorites! Thanks for reading! The sweater is gorgeous! The blue bracelet and cap toes really play off of the neon...love it! Thanks Debbie! My husband told me that I was glowing with this sweater , so I tried to play it down by adding in blue! Thanks for reading! 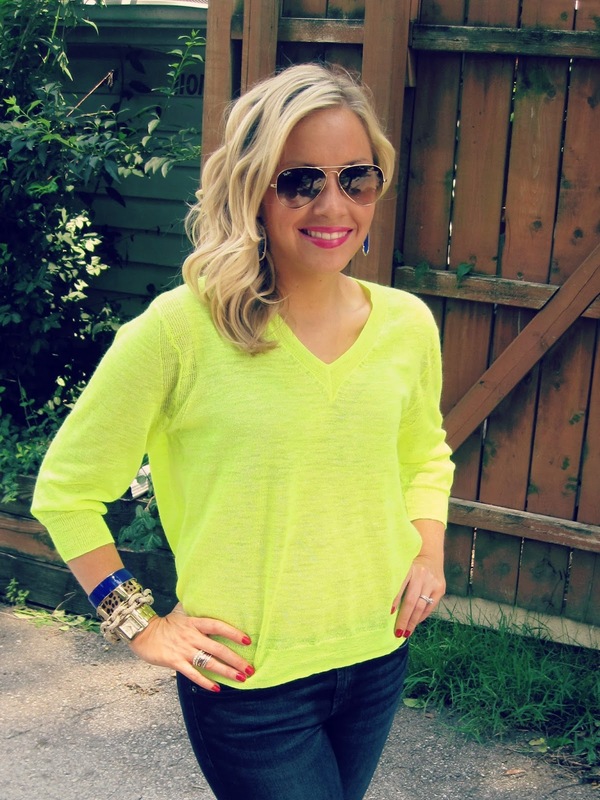 Love the pops of neon in your sweater, shoes and on your lips! Perfect casual summer look! Thanks Sam! I was glad I got to squeeze this outfit in before it got too HOT! The hot.humid weather is officially back! I love neon yellow and cobalt together! Very cute color combo! Thanks Katie! Neon is so fun! My husband could not believe how bright this shirt was! I love it! Loved pairing it with cobalt! Thanks Carly! I have had these shoes forever! This is probably the second time I have worn them! They are so fun and comfy! Your hair is the cutest! Do you have a natural curl? very jealous! Your outfit is the perfect casual look :) Right out of Gap! I love casual outfits! So comfy and loose! Love adding neon to my wardrobe! Such bright and fun for summer! Love this look, Jac! I'm in a cobalt blue phase right now...I am considering it a neutral :) haha have a great week!! Thanks Steph! Cobalt blue is such a fun color! It is a good color to work with! You can pair or match it with so many items! Thanks Kelsey! I always love adding accessories once I put an outfit together! Sometimes I can get carried away! This shirt was a lot brighter than I thought! I love it! Even though I'm pretty sure I glow when I wear it! I love this look on you! Your arm candy goes perfectly. And those blue cap toe flats are adorable. Love pairing neon with blue! You look cozy and cute- the perfect combination! This is such a comfy outfit! Too hot to wear this week! Can't wait to wear it again! Thanks Nana! Love these! I need to wear them more! That neon sweater looks SO cute & comfy...love it! Thanks Annie! Love this sweater! So glad I got it! Great look in your neon sweater, love this combination with denim. Thanks for sharing with Visible Monday. Thanks Patti! Such an easy comfy outfit!